The Nashville Predators recalled Gabriel Bourque from Milwaukee today to provide an additional spark for the 0-0-2 team. He was a key contributor as a rookie last season and has been sidelined recently with injuries. Nashville, Tenn. (January 22, 2013) – Nashville Predators President of Hockey Operations/General Manager David Poile announced today that the club has recalled forward Gabriel Bourque from Milwaukee (AHL). Bourque, 22 (9/23/90), has 12 points (7g-5a) in 15 games for the Admirals this season. During his rookie NHL campaign last season, the Rimouski, Que., native ranked ninth in points per game among rookies who appeared in at least half their team’s games (.44), finishing with 19 points (7g-12a) in 43 games. In the 2012 Playoffs, the 5-10, 192-pound left wing tied for the team lead in goals (3), and ranked third in points (5), setting franchise records for points (3g-1a-4pts) and plus-minus rating (+5) by a rookie in a playoff series in the Western Conference Quarterfinals vs. Detroit. The Predators take on the Minnesota Wild tonight at the Xcel Energy Center at 7 p.m. CT (Comcast channels: 1675 HD, 28 SD and 102.5 The Game) in the first of a seven-game, 15-day road trip that keeps the team out of Nashville until Feb. 7 when they face off against the defending Stanley Cup Champion Los Angeles Kings at Bridgestone Arena. Individual game tickets and premium seating for the Nashville Predators 2012-13 regular season are on sale now at the Bridgestone Arena box office, through all Ticketmaster outlets, Ticketmaster.com, nashvillepredators.com and (615) 770-7800. Returning this season are the popular Tennessee Lottery $10 Gameday Seats where 100 upper-level tickets will be made available for just $10 each on the day of the game. These tickets may only be purchased at the Bridgestone Arena box office beginning at 10 a.m. on the day of each specific game. Tickets distributed through raffle system. Limit four per customer. There's not too many comments from the couch tonight, primarily due the the scheduling of a 5 p.m. start on a day when everyone in the Mid-state area that doesn't work for the government or a bank was either at work or heading out into rush hour traffic for the puck drop. I find it totally incredible that for the second game in a row that Bridgestone Arena had a sellout crowd of 17,113. In spite of all the intense whining and gnashing of teeth during the lockout, citizens of Smashville have obviously forgiven and forgotten all the angst of the past four months. For the Predators, tonight's hero had to be Patric Hornqvist who had his tenth career three point game with a goal and two assists. Mike Fisher and Marty Erat also has two point games in the loss. I wonder if anyone got a "no, no, no, no, no..." out of him in the postgame interviews. The Preds were outshot 39-24 and fared even worse in the Corsi at 71-42. They have got to start getting more pressure on the opponent goalie. Newcomer Rich Clune, received minimal ice time after picking up a boarding penalty against Scotty Nichol on his second shift early in the game. He only skated one shift in the second period and a pair in the third. The Preds' power play continued to be productive with another pair of goals but the PK unit is starting to come into question, giving up a goal in two chances to the Blues. In spite of Paul Gaustad being out of the lineup, the Preds were 36 of 64 in the faceoff circle for a 56% win percentage. Everyone who entered the circle was at least 50% but Mike Fisher was a glutton for punishment, taking 26 faceoffs and winning 14. Nick Spalling was also tough, winning 10 of 15. The Predators have never had a drop dead sniper in the shootout but Pekka Rinne has made up for that in recent years. For two games in a row, he has been out-dueled by lesser talent, unfortunately, resulting in two loses. Tuesday's game against Minnesota should draw banner TV ratings with the Predators facing off against Ryan Suter in the Minnesota green for the first time. I'm sure it will be billed as "mamo a mano" between the ex-defensive pairing but in spite of that, it will be good to see how the "new look" Wild perform with all the new faces (and the empty wallet). Nashville Predators rookie defenseman Victor Bartley has had an exciting few days lately but in the end was returned to Milwaukee today where he will probably stay for a while. Bartley was one of three Admiral defensemen (along with Ryan Ellis and Jon Blum) that was invited to the Preds abbreviated training camp which was left with an unwieldy eight D-men when the final cuts were made on Friday. Bartley did not dress in the Predators 3-2 shootout loss to Columbus on Saturday night. On Thursday, in the midst of the Preds camp, Bartley was named as a participant in the Dunkin Donuts AHL All-Star Classic to be held Jan. 27-28 in Providence, R.I.
After much being made of the Predators depth being needed in this year's short season, you would expect Bartley to be the first defenseman recalled should an injury occur. The Preds opened up with as close to a "bye" as you could find, having won 19 of the last 20 home games against the Columbus Blue Jackets. At least the sieve, Steve Mason, didn't start. The BJ's have worked hard at earning the title of doormat of the Central Division NHL. The sold out crowd in the arena got their money's worth with 65 minutes of end to end action and six rounds of a shootout before the Jackets doubled their recent Bridgestone win total on a Derick Brassard shot that got past Pekka Rinne to give Columbus the 3-2 victory. Fox Sports Tennessee had a double fail to start the game. First, through no fault of their own, the Alabama-Texas A & M basketball game ran long. Then, in a major disaster for those wanting to see #hockeyisback, FSTN switched to some meaningless tennis match for the first several minutes of the contest, including Marty Erat's goal 39 seconds into the game. Stick tap to Pekka Rinne who got the first goalie point of the season on Erat's goal. Scott Hannen made a good first impression on his teammates when Derek Dorsett put a clean hit on Kevin Klein near the boards and Hannen responded and went toe to toe with the Jacket's agitator. On the Jackets' power play goal there was nothing Pekka Rinne could have done with Nick Foligno's perfect tip on the Fedor Tyutin's shot. Foligno also got a pipe on a power play midway through the second period when he had Rinne out of position. After leading the NHLlast season on the power play with ex Pred Ryan Suter having the most points, it was a real confidence builder to see Ryan Ellis get the goal on the Preds first man advantage opportunity this season on a feed from Sergei Kostitsyn trying out his new role on the point. Kostitsyn was a point a game player in the KHL and continued his success this year with primary assists on the Preds' first two goals. If he continues, he may be an option in fantasy leagues. It probably wan't a great idea for Captain Shea Weber to tangle with Jared Boll as he stepped up for Craig Smith who Boll hit before the fight. Weber really needs to leave the fisticuffs to others so he can stay out of the box and off injured reserve in the short season. Barry Trotz did a lot of mixing and matching on his third and fourth lines but was fairly consistent with the Fisher-Kostitsyn-Erat and Legwand-Smith-Hornqvist combinations. Colin Wilson also earned plenty of minutes, playing on several lines. Weber-Josi, Klein-Hannen, and Gill-Ellis seemed fairly set. You have to wonder when Jon Blum or Victor Bartley will play. The one issue that was most concerning for the Preds was sloppy play on the breakout of their defensive zone. There were too many giveaways that would turn into goals against a better opponent. The Predators mad a decent push at the end of the third period to try to avoid the dreaded three point game but it was to no avail. The pressure continued into overtime but it still headed to the skills competition. The Preds will go at it again at 5 p.m. Monday against St. Louis at Bridgestone Arena. Someone needs to give a heads up to the scheduling gurus that most fans in Middle Tennessee do not have a day off for MLK Day. For many STH, it is a useless ticket with the start being when most folks are still at work. Nashville to win Stanley Cup: You heard it here first! This year's NHL season is finally upon us after months of highs and lows for fans when word would leak out that a resolution to the lockout was near only to be dashed by harsh words from the negotiating parties. Frankly, for most of the lockout, I thought we were looking at a rerun of the lost season of 2004-05. That being said, anyone who says with authority that they are confident in their picks for this year's 16 playoff teams is completely delusional. In the shortened 48 game season, any of the 30 NHL teams has a shot at being in the post season (except for Columbus, of course). The teams that have the most continuity from last season, the fewest injuries to key players, and have the hottest goalie can sneak into the top eight in either conference with even average talent on the roster. Those are keys in any season but with less room for error, they will me magnified much so in this three month sprint to the playoffs. With the full expectation being called a homer, I predict that the Rangers will win the President's trophy by a hair over Vancouver and will eventually meet the Predators in the Stanley Cup Finals. The Cup winner will be the Predators and many will say that there should be an asterisk in the record book due to the shortened season. So there it is, guesses as bad as anyone else's. At least in this storybook fantasy, there is a happy ending for the citizens of Smashville. After an abbreviated training camp, there were only a couple of surprises in the Predators 23 man opening night roster that was announced today. The final cut was forward Chris Mueller who has played 19 games with the Preds over the last couple of seasons. Another surprise was that the team kept eight defensemen, including 24 year old Victor Bartley, who has never played in an NHL contest but was recently named an AHL all-star. Bartley was signed as a free agent in the summer of 2011 and has had one and a half solid seasons in Milwaukee of the AHL. 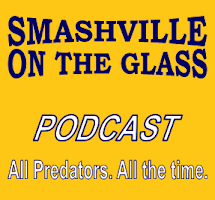 The roster marks the return of defenseman Jon Blum who struggled early last season after playing well for the Preds in late in the 2010-11 season and playoffs. Goalie Chis Mason returns to the Predators organization for his third stent with the team, dating back to the franchise's first season when he appeared in three games as a rookie. Always a fan favorite, he has played with St. Louis and Atlanta/Winnipeg since he left the Preds in 2008. Former Sharks D-man, Scott Hannan, will make his Predator debut after playing 348 career regular season games for San Jose, where he had 79 points and a plus-37 rating. He also played in 58 playoff games having a goal and adding 12 assists. The roster also features forward Richard Clune, a pick up during training camp, that brings similar talents to the ice that former Pred Jordin Tootoo provided in year's past. Clune appeared in 14 games and 4 playoff contests for the L.A. Kings in 2009 and has since patrolled the ice for the Manchester Monarchs, posting picking up 601 penalty minutes over the last three full seasons. Missing from the squad is a surprise from last year's team, forward Gabriel Bourque, who came up at mid season and played 43 games, picking up seven goals and twelve assists as a rookie. He also picked up five points in ten playoff games. Injuries have limited him to 13 games in Milwaukee this season. Finally, with Ryan Suter leaving for Minnesota, Marty Erat was awarded the second "A" as the alternate captain along with Mike Fisher. The newly re-signed, Shea Weber remains captain and probably will retain that title for years to come. Saturday's puck drop against the Columbus Blue Jackets will be shortly after 7 p.m. at Bridgestone Arena. Early this morning, after an all day and night bargaining session between the NHL and NHLPA, with an assist to US federal mediators, a tentative agreement was reached that should lead to a shortened 2013 season, that will allegedly begin in the next couple of weeks. It is reported that it will be a ten-year deal so most current players will not have to go through another labor dispute during their careers and fans will not have another lockout looming on the horizon anytime soon. The big winners in the dispute resolution are the folks whose livelihood depends on games being played and fans filling the arenas. All of the arena workers who have lost 15 or 16 home games worth of income should soon be manning their posts in 30 venues across North America. Other businesses and employees that depend on foot traffic from games to sell dinners, drinks, and fan related merchandise are also on the winning side of the ledger. I am also thrilled for journalists and radio media who can actually discuss topics related to the actual sport of hockey instead of the latest rumors (or lack there of) regarding the negotiations. I have hung with NHL Radio on XM for the duration of the lockout and found that they are quite entertaining without hockey as the centerpiece of the discussion. I am looking forward to the drone of the season where the arguments are about how many games someone should be suspended for an illegal hit. The big losers, in the short run, are the owners and players who pissed away a third of the season and came across as greedy entities with no regard for the game of hockey or the fans that provide the revenue to be able to earn livings based on playing and presenting a child’s game from frozen ponds of the north. So what now? Do the fans act as mindless drones and run back to the arenas as they did after the 2004-2005 lockout or have they found other things to do to fill time and spend their entertainment dollars. My friend Su Ring compared the situation to a boyfriend or girlfriend that disappears for six months and then shows back up on the front doorstep one day and expects things to be the same with no love lost. From a look at social media today, it appears most fans don’t mind getting ignored by their boy/girlfriend as long as they eventually come back. I understand the intense love of the game that is somewhat special to hockey fans but before they go all giddy, they should really take a hard look at what has occurred over the last hundred plus days and consider how they have been treated by those who are supposed to be the caretakers of the game. Forgiveness is a great virtue but not one to be taken lightly.